The Foundation is responsible for the 1858 Town House which was originally the 1858 Townhouse, built in 1858 with a bequest from Thomas Dowse’s will and listed on the National Register of Historic Places. Elbridge Boyden, a noted architect who also designed Mechanics Hall in Worcester, designed the Town House. Boyden’s design incorporated an Italianate style similar to other East Coast buildings at the time. The building rises two-and-a-half stories to a gable roof and cupola with a gilded weathervane. 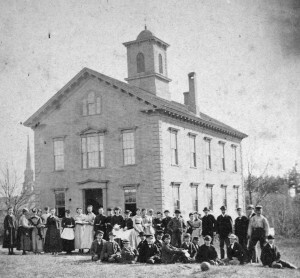 The Townhouse first served as Sherborn’s high school from 1859–1873, hence the School Room on the first floor. For over 100 years, it was at times the Town’s library, municipal offices, police department, post office, and the Board of Selectmen’s office. In the summer of 1985, the town was planning to sell the condemned, dilapidated building. Alarmed at the prospect of losing Sherborn’s oldest public building, concerned citizens petitioned the Board of Selectmen to abandon the sale so it could be restored. These citizens created a non-profit foundation, the Sherborn Community Center Foundation, and over the next five years the Foundation raised almost $1 million almost entirely from private donors. The Foundation used these donations to restore the 1858 Town House to its 19th century glory. The original white embossed tin walls and ceilings were restored and painted and the exterior colors returned to their original hues. The original cedar-shingled roof was replaced. The cupola, a New England mainstay, was rebuilt, including installing a new copper roof and weathervane. Local artist Anita Sebastian stenciled historically accurate wall treatments in the first floor’s conference room and bathrooms and later painted a stylized mural depicting early Sherborn in the first floor School Room. The newly restored building reopened its doors to the public in May 1992 with a dedication of the second floor to the Lewis family, followed by a Victorian Ball. The majestic chandelier in the Great Hall, contributed by St. Theresa’s Church of Sherborn, was dedicated to the late Father John O’Connor. The Sherborn Players community theater group produced a show called Back Home Again to inaugurate the Great Hall’s stage. One year after the restoration, the building received the Massachusetts Historical Commission Preservation Award for the restoration and was listed on the National Register for Historic Places. The Foundation continues to maintain the building by using public donations, grants, and facility rentals. The foundation’s all-volunteer board manages the building for primarily the benefit of the community’s non-profit and civic groups. The building also is available to private citizens at market rates.